Electric generating capacity expansion has been always an essential way to handle the electricity shortage, meanwhile, greenhouse-gas (GHG) emission, especially CO2, from electric power systems becomes crucial considerations in recent years for the related planners. Therefore, effective approach to dealing with the tradeoff between capacity expansion and carbon emission reduction is much desired. In this study, an interval mixed-integer non-linear programming (IMINLP) model was developed to assist regional electric power systems planning under uncertainty. CO2 capture and storage (CCS) technologies had been introduced to the IMINLP model to help reduce carbon emission. 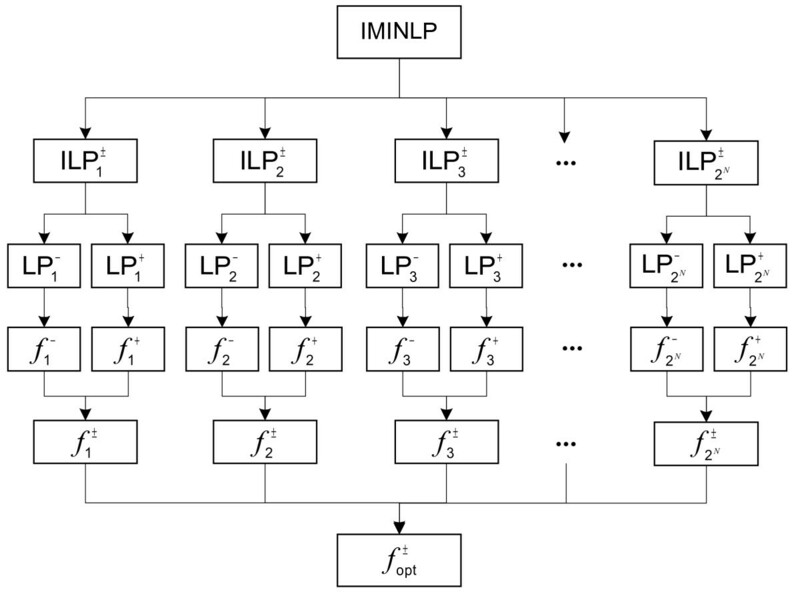 The developed IMINLP model could be disassembled into a number of ILP models, then two-step method (TSM) was used to obtain the optimal solutions. A case study was provided for demonstrating applicability of the developed method. The results indicated that the developed model was capable of providing alternative decisions based on scenario analysis for electricity planning with consideration of CCS technologies. The IMINLP model could provide an effective linkage between carbon sequestration and electric generating capacity expansion with the aim of minimizing system costs. Due to rapidly growing population and booming economy, electricity shortage is becoming a significant challenge towards regional electric power systems (REPS). Electric generating capacity planning is obviously an essential approach to deal with this issue. The traditional aim of an electric power utility has focused on providing an adequate supply of electric energy at minimum cost (Karaki et al. ). In fact, such a planning decision is considerably complicated as it is not only involving a large number of social, economic, political and technical factors and their interactions, but also coupled with complex temporal and spatial variabilities (Lin and Huang [2009b]). Moreover, global climate change induced by the emission of greenhouse gas (GHG) may pose challenges to the fundamental structure of electric power systems (Hidy and Spencer ; Wise et al. ); meanwhile, the vulnerability of energy sources, in particular of renewable sources, raises the need to identify sustainable adaptation measures (Merrill and Wood ; de Lucena et al. ). Therefore, effective planning for electric power system under various uncertainties and dynamic complexities is much desired. Previously, a number of studies were conducted for planning electric power system expansion. For example, Sanghvi and Shavel () developed a linear constraint that can be incorporated explicitly into a linear programming (LP) formulation of an electric utility’s capacity expansion planning problem. Zafer Yakin and McFarland () introduced a non-linear programming approach for long-range generating capacity expansion planning. In recent years, considerable efforts were made to develop energy systems planning models with consideration of GHG emission reduction under uncertainty (Voropai and Ivanova ; Cai et al. [2009a, b]; Lin et al. ; Wu et al. ; Yan et al. ). Cao et al. () employed an integer programming model with random-boundary intervals for planning municipal power systems, and Li et al. () used a multistage interval-stochastic integer linear programming approach to deal with uncertainties existing in regional power system planning. Lin and Huang ([2009a, b, 2010]) developed a series of inexact energy systems planning models for supporting GHG emission management and sustainable renewable energy development under uncertainty. The previous studies emphasized on the planning of either electric power systems or entire energy systems by regarding the GHG emission reduction as a single constraint. Studies on how to apply new technologies related to CO2 capture and storage (CCS) or adjust the electricity generating structure, however, have hardly been covered in their models. CCS is the key technology that reduces carbon emissions from coal-fired power plants, and as such is essential since coal is at present the predominant fuel for electricity and responsible for no less than 40% of global CO2 emissions (de Coninck et al. ). In addition, CCS is regarded as one of the most promising technologies for reducing GHG emissions from fossil fuel use (Mitrovic and Malone ). As a result, it is necessary to incorporate CCS technology into electric power systems management and provide the decision makers with comprehensive optimization solutions by assessing its contribution to CO2 emission deduction and impacts on electricity generation and capacity expansion. 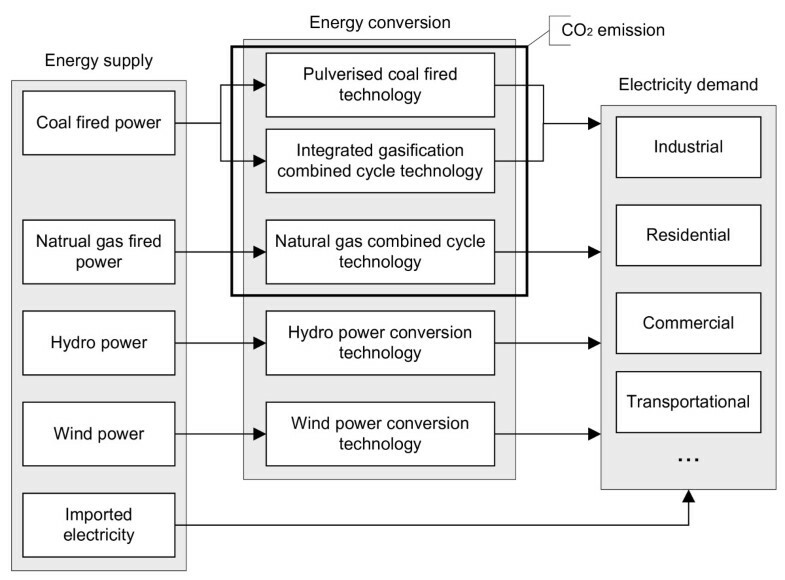 Therefore, the objective of this study is to develop an interval mixed-integer non-linear programming (IMINLP) model to support regional electric power systems planning with consideration of CO2 capture and storage technologies within an optimization framework. The main tasks will consist of (i) modeling of a typical electric power system in regional level in collaboration with electricity generation, capacity expansion, application of CCS technologies, sustainability and reliability of electricity energy market, and fluctuated electricity demands; (ii) integrating interval-parameter programming techniques into the developed model to formulate an IMINLP model; and (iii) applying the IMINLP model to a regional electric power system to demonstrate its effectiveness in providing decision bases in terms of electricity planning with CCS technologies. A typical electric power system is related to a number of energy supply, energy conversion and electricity demand activities (shown in Figure 1). The side of energy supply describes the main construction of the power system, including fuel-fired power (coal and natural gas), hydro power and wind power. Imported electricity is essential to offset electricity shortage in short term owing to increasing demand. 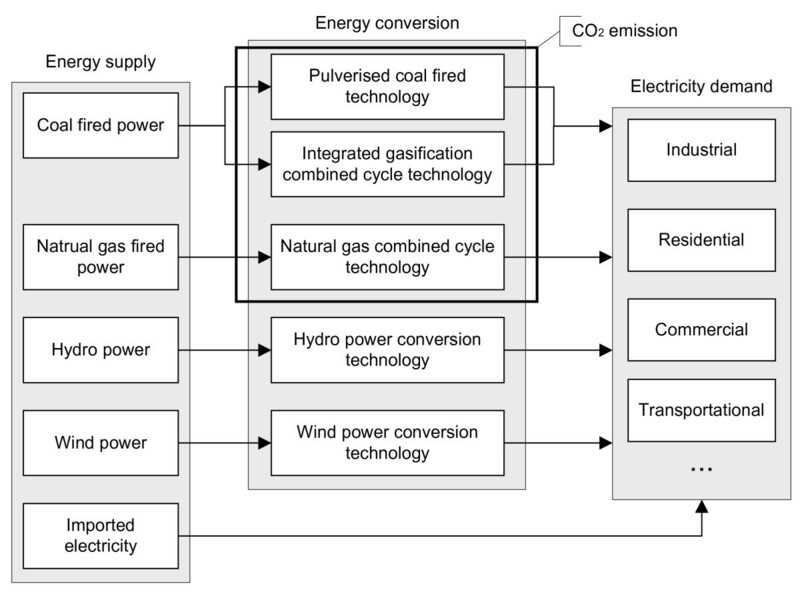 Major energy conversion technologies related to electric power system contains pulverised coal fired technology (PC), integrated gasification combined cycle (IGCC), natural gas combined cycle (NGCC), hydro power conversion, and wind power conversion. Among these five technologies, PC, IGCC and NGCC technologies are the key contributors to CO2 emission. Most of generated electricity is distributed to different sectors such as industries, residents, commences, transportations and so on. Planning of such a system is challenged by increasing end-users’ electricity demands, impacts on global climate change induced by CO2 emission, and shortage of resources. Besides, many modeling parameters are very inexact and sometimes only be available as intervals, such uncertain information needs to be reflected in an optimization framework. The desired IMINLP model is to tackle a variety of complexities and uncertainties existing in regional electric power systems, and to help decision makers balance electricity supply and demand with minimized total system cost subject to a variety of constraints. Structure of regional electric power systems. Dimensions:i, electricity generation facilities, i = 1, 2, …, K, K + 1, …, N (i ≤ K indicate all combustion facilities with CO2 emission; j, CO2 capture technologies, j = 1, 2, …, J; t, time periods, t = 1, 2, …, T.; Xit, electricity generated from facility i during period t (PJ); Yit, scale of capacity expansion needs to be undertaken to the facility i during period t (GW); Zij, binary variables identifying whether or not CO2 capture technology j needs to be undertaken to the facility i; IMt, imported electricity during period t (PJ). ; CEGit, cost for electricity generation of facility i during period t ($106/PJ); CCEit, capital cost for capacity expansion of facility i during period t ($106/GW); Oi, existing capacity of facility i (GW); Fij, binary variables indicating if CO2 capture technology j is applicable to facility i (1: applicable, 0: not applicable); CINijt, cost for installing equipments in accordance with CO2 capture technology j to facility i during period t ($106/GW); COPijt, operating cost (including all expenditure in transporting and storing captured CO2) for CO2 capture equipments which are installed to facility i during period t ($106/PJ); Ht, cost of imported electricity during period t ($106/PJ); Dt, total electricity demand during period t (PJ); Uit, units of electricity production generated by per unit of capacity of facility i during period t (PJ/GW); Nt, minimum rate of renewable energy supplied electricity in the total demand during period t; ηi, units of CO2 emitted by per unit of electricity production for fkacility i ∈ [1, K] (106kg/PJ); λij, reduced rate of CO2 emission for facility i ∈ [1, K] after CO2 capture technology j has been applied (106kg/PJ); rij, CO2 capture efficiency of technology j for facility i ∈ [1, K] (0 < rij < 1); Git, allowable upper bounds of CO2 emission for facility i ∈ [1, K] during period t (106kg). ; Emaxit, allowable upper bounds of capacity expansion for facility i during period t (GW). ; Et, maximum rate of imported electricity in the total demand during period t..
Decision variables:i, electricity generation facilities, i = 1, 2, …, K, K + 1, …, N (i ≤ K indicate all combustion facilities with CO2 emission; j, CO2 capture technologies, j = 1, 2, …, J; t, time periods, t = 1, 2, …, T.; Xit, electricity generated from facility i during period t (PJ); Yit, scale of capacity expansion needs to be undertaken to the facility i during period t (GW); Zij, binary variables identifying whether or not CO2 capture technology j needs to be undertaken to the facility i; IMt, imported electricity during period t (PJ). ; CEGit, cost for electricity generation of facility i during period t ($106/PJ); CCEit, capital cost for capacity expansion of facility i during period t ($106/GW); Oi, existing capacity of facility i (GW); Fij, binary variables indicating if CO2 capture technology j is applicable to facility i (1: applicable, 0: not applicable); CINijt, cost for installing equipments in accordance with CO2 capture technology j to facility i during period t ($106/GW); COPijt, operating cost (including all expenditure in transporting and storing captured CO2) for CO2 capture equipments which are installed to facility i during period t ($106/PJ); Ht, cost of imported electricity during period t ($106/PJ); Dt, total electricity demand during period t (PJ); Uit, units of electricity production generated by per unit of capacity of facility i during period t (PJ/GW); Nt, minimum rate of renewable energy supplied electricity in the total demand during period t; ηi, units of CO2 emitted by per unit of electricity production for fkacility i ∈ [1, K] (106kg/PJ); λij, reduced rate of CO2 emission for facility i ∈ [1, K] after CO2 capture technology j has been applied (106kg/PJ); rij, CO2 capture efficiency of technology j for facility i ∈ [1, K] (0 < rij < 1); Git, allowable upper bounds of CO2 emission for facility i ∈ [1, K] during period t (106kg). ; Emaxit, allowable upper bounds of capacity expansion for facility i during period t (GW). ; Et, maximum rate of imported electricity in the total demand during period t..
Parameters:i, electricity generation facilities, i = 1, 2, …, K, K + 1, …, N (i ≤ K indicate all combustion facilities with CO2 emission; j, CO2 capture technologies, j = 1, 2, …, J; t, time periods, t = 1, 2, …, T.; Xit, electricity generated from facility i during period t (PJ); Yit, scale of capacity expansion needs to be undertaken to the facility i during period t (GW); Zij, binary variables identifying whether or not CO2 capture technology j needs to be undertaken to the facility i; IMt, imported electricity during period t (PJ). ; CEGit, cost for electricity generation of facility i during period t ($106/PJ); CCEit, capital cost for capacity expansion of facility i during period t ($106/GW); Oi, existing capacity of facility i (GW); Fij, binary variables indicating if CO2 capture technology j is applicable to facility i (1: applicable, 0: not applicable); CINijt, cost for installing equipments in accordance with CO2 capture technology j to facility i during period t ($106/GW); COPijt, operating cost (including all expenditure in transporting and storing captured CO2) for CO2 capture equipments which are installed to facility i during period t ($106/PJ); Ht, cost of imported electricity during period t ($106/PJ); Dt, total electricity demand during period t (PJ); Uit, units of electricity production generated by per unit of capacity of facility i during period t (PJ/GW); Nt, minimum rate of renewable energy supplied electricity in the total demand during period t; ηi, units of CO2 emitted by per unit of electricity production for fkacility i ∈ [1, K] (106kg/PJ); λij, reduced rate of CO2 emission for facility i ∈ [1, K] after CO2 capture technology j has been applied (106kg/PJ); rij, CO2 capture efficiency of technology j for facility i ∈ [1, K] (0 < rij < 1); Git, allowable upper bounds of CO2 emission for facility i ∈ [1, K] during period t (106kg). ; Emaxit, allowable upper bounds of capacity expansion for facility i during period t (GW). ; Et, maximum rate of imported electricity in the total demand during period t..
where the parameters with superscript “±” are interval numbers. An interval number can be expressed as a± = a−a+, representing this parameter can be any value of the interval with minimum value of a− and maximum one of a+ (Huang et al. [1992, 1995b]). In the IMINLP model (2), there are four decision variables X it Y it Z ij IM t . The arithmetic products (i.e. X it Z ij and Y it Z ij ) make this model non-linear, so the two-step method developed by Huang et al. () to solve ILP models is not applicable in this case. Due to the binary integer variable Z ij being used to indicate whether CO2 capture technology j should be applied to facility i, that means the total number of combinations of technology and facility is always limited in reality. Therefore, the IMINLP model can be converted into a number of ILP models by enumerating all possible values of Z ij . Then, Huang’s two-step method can be used to solve each ILP model separately. The final optimal solution must locate in the result set containing output of all ILP models, and it can be obtained according to corresponding criteria. Figure 2 illustrates the process of solving the IMINLP model. Flowchart of solution method for IMINLP model. where Q j indicates the set of subscript i for y i = 1, and j ∈ [1, 2 N ]. Assume the optimal solutions of f j + submodel were x j i o p t + , f j o p t + . Thus, we have the solution for model (4): f j o p t ± = f j o p t − , f j o p t + , x j i o p t ± = x j i o p t − , x j i o p t + , y j i o p t = 1 i ∈ Q i , y j i o p t = 0 i ∈ N − Q i . Accordingly, the other 2 N -1 solutions can be obtained by repeating the above procedure. Define f j o p t ± ¯ is the median value of interval f j o p t ± = f j o p t − , f j o p t + . Since the objective of model (3) is to find the minimum value of f, the screening rule for the optimal solution from result set can be summarized as that k th solution is the best solution if and only if f k o p t ± ¯ = min f 1 o p t ± ¯ , f 2 o p t ± ¯ , f 3 o p t ± ¯ , … , f 2 N o p t ± ¯ . Assume the optimal solutions of f+ submodel were X i t o p t + , Y i t o p t + , I M t o p t + , f opt + . Thus, we have the solution for model (9) as follows: f opt ± = f opt − , f opt + , X i t o p t ± = X i t o p t − , X i t o p t + , Y i t o p t ± = Y i t o p t − , Y i t o p t + , I M t o p t ± = I M t o p t − , I M t o p t + . The regional electric power system to be studied is based on representative cost and technical data obtained from energy systems planning and CCS technologies related literatures (Lin and Huang [2009b]; Li et al. ; Bowen ; Mitrovic and Malone ). The system covers a time horizon of three periods (t = 1,2,3), with each one having five years. Period 1 represents years 2012–2016, period 2 means 2017–2021, and period 3 would be 2022–2026, respectively. Its electricity generation is supported by two coal-fired power plants (one is traditional with PC technology, the other has been built recently with IGCC technology), one natural gas-fired power plant with NGCC technology, one hydro power station and one wind power plant. These five electricity facilities can be symbolized as i = 1,2,3,4,5 in sequence. Table 1 shows the existing capacity, allowable upper bound of capacity expansion and units of electricity production generated by per unit of capacity for each facility. Table 2 lists the costs of electricity generation and capacity expansion. The CO2 capture technologies mainly contain post-combustion (j = 1), pre-combustion (j = 2), and oxyfuel combustion (j = 3). These three capture technologies are only applicable to all fuel-fired facilities. In particular, pre-combustion capture technology is not suitable for pulverised coal-fired power plants. Table 3 shows all parameters related to CCS technologies. The total electricity demands would rise with the economic development. Thus the decision makers are forced to decide how to plan capacity expansion based on existing facilities to meet end-users’ increasing demands. Meanwhile, it is very important to apply suitable and affordable CCS technologies to reduce CO2 emission. Electricity demand D t varies for different periods with [930, 1000] PJ in the 1st period, [1150, 1200] PJ in the 2nd period and [1330, 1400] PJ in the 3rd period. The renewable energy rate N t must meet the requirements of [0.10, 0.12] for 1st period, [0.15, 0.18] for 2nd period and [0.20, 0.22] for 3rd period, respectively. Imported electricity price H t shows an increase trend from [15, 18] $106/PJ to [24, 30] $106/PJ, and ending with [40, 45] $106/PJ in the 3rd period. The imported rate for electricity E t is [0.08, 0.10] for 1st period, [0.09, 0.11] for 2nd period and [0.10, 0.12] for 3rd period, respectively. The IMINLP model will be employed to facilitate planning for this regional electric power system. The general solution method is to be used under two scenarios of CO2 emission limitation (i.e. high and low emission standards) in order to help planners well understand its impacts on the results (shown in Table 4). In reality, choosing suitable CO2 capture technology for a given electricity facility is not only decided by technical feasibility, but also related to geographical location availability for carbon transportation and storage, as well as its impacts on the social community and economic development. However, such information is usually not available or needs to be further investigated. Therefore, planners’ preferences on CO2 capture technologies will be helpful and needs to be taken into consideration during the solving process. 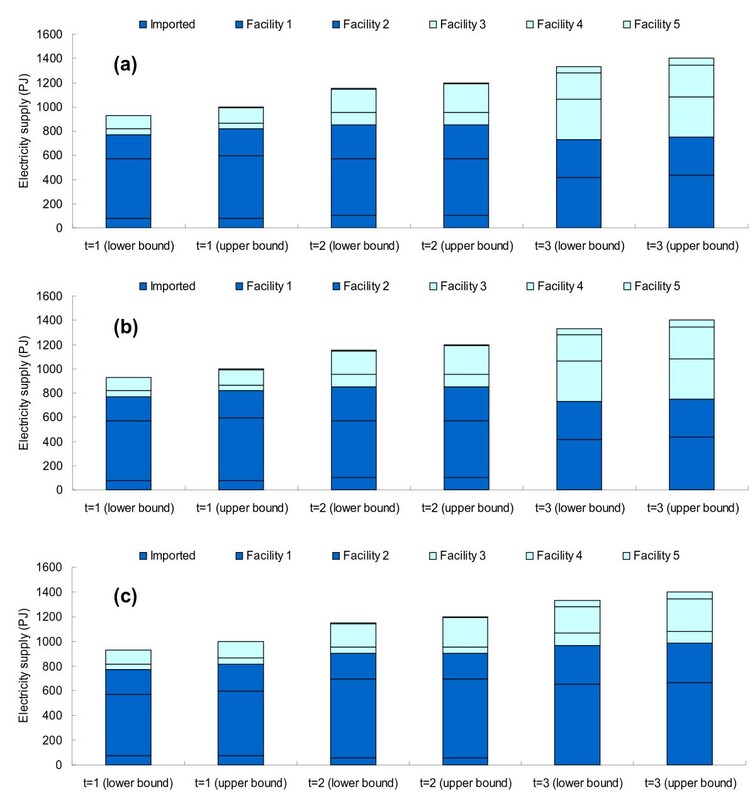 In this study, we assume that decision makers are only interested in three policies: (i) all facilities with post-combustion capture technologies; (ii) facilities 1, 2 with post-combustion capture, facility 3 with pre-combustion; and (iii) all facilities with oxyfuel combustion technologies. Comparison of electricity supply in two scenarios: (a) results of high emission scenario; (b) results of low emission scenario. Comparison of electric generation capacity expansion in two scenarios: (a) results of high emission scenario; (b) results of low emission scenario. Optimization solutionsFirstly, the results of planning without consideration of decision makers’ interests in choosing CO2 capture technologies are discussed. That means we need to cover all combination of technologies when disassembling the IMINLP model into (J + 1) K ILP models. The optimal solutions for two CO2 emission scenarios concerning imported electricity, generation of local facilities and their corresponding capacity expansion in periods 1, 2, and 3 are listed in Table 5. The total cost for high emission scenario is [53714.63, 69399.39]$106, which is obviously lower than the cost at low emission scenario about [65326.26, 81953.3]$106. In order to make better understanding of the results, some comparisons based on these two scenarios are further conducted. Figure 3 shows the comparison of electricity supply schemes between high and low CO2 emission scenarios. There are apparent differences in the trends of energy supply from import for facility 1 and 3. In the high emission scenario, contributions of imported sector and facility 3 are decreasing within the range below 100 PJ, while electricity generated by facility 1 is increasing from approximate 500 to 650 PJ. By contrast, the low emission scenario indicates another situation in the opposite way regarding the electricity supplied by imports for facility 1 and 3. The electricity contribution of imports and facility 3 are always growing within the whole planning horizon, especially, generation of facility 3 has jumped from about 50 to 300 PJ. Meanwhile, facility 1 shows a descending way from 400 to 300 PJ. This comparison reveals that facilities 1 and 3 are playing important role in the total CO2 emission of the study power system as there are significant difference between high and low emission scenarios. As for the other three facilities (2, 4, and 5), there are no obvious differences in the comparison. In other words, it can be seen that the contributions of these facilities in some extent have relative smaller or no impacts on the CO2 emission. In fact, the facilities 4 and 5 indicate hydro and wind power plants, and facility 2 means natural gas-fired power plant. Hydro and wind power indeed have no CO2 emission except the natural gas power, however, its impact stands less than that of coal-fired plants (i.e. facilities 1 and 3). The electricity is then imported to cover the shortage while capacity expansion can not meet the increasing demands under restricted CO2 emission standards. The comparison of capacity expansion for two scenarios is presented in Figure 4. The expansions for hydro and wind power are almost keeping a stable level. But for the facilities 1, 2, and 3, the capacity expansions are very different. In particular, the expanding scale of facility 1 stands at the highest among these three facilities in the high emission scenario; however, its expansion is not suggested at all in the low emission scenario. The reason is obviously related to its important contribution to the total CO2 emission of the entire electric power system.Secondly, the rates of imported electricity and renewable energy in the two emission scenarios are compared to further assess the security of power system structure. The results are shown in Figure 5. The rate of imported electricity is increasing to about 8% in the low emission scenario; the reason is that capacity expansion of local facilities is restricted by the low emission standards. Therefore, electricity needs to be imported to meet the growing demands. The declining trend of imported electricity in high emission scenario also demonstrates its interaction in the opposite way. Obviously, the higher the rate of imported electricity, the more insecurity or instability the power supply structure will be. In turn, the lower the rate, the more CO2 will be emitted. Therefore, there is a tradeoff between the safety of power supply framework and lower CO2 emission. As shown in Figure 5, there is no significant change in the rate of renewable energy in two scenarios. Such relative stability is mainly limited by the corresponding constraints in the IMINLP. Policy analysisDecision makers’ preference plays an important role in the selection and penetration of CO2 capture and storage technologies; furthermore, it could affect the structure of electricity supply and capacity expansion planning in the regional electric power system. Therefore, three scenarios are conducted to demonstrate the influences of different policies for CO2 sequestration. Policy on all facilities being applied post-combustion capture technologies is considered in scenario A; facilities 1, 2 with post-combustion capture, facility 3 with pre-combustion is considered in scenario B; and all facilities with oxyfuel combustion technologies is processed in scenario C. The total system costs for three scenarios are [58232.08, 74128.19] $106, [57777.78, 73682.44] $106, and [56265.91, 73380.01] $106 respectively. The electricity supplies under different scenarios during the planning period are shown in Figure 6. There is no difference in the structure of electricity supply between scenarios A and B. The results for capacity expansion are also the same. The reason should be the only difference in choosing CO2 sequestration technologies for facility 3. However, the system costs for scenario A and B are entirely different. This indicates the oxyfuel combustion is a cheaper way for facility 3 compared with post-combustion technology. Under scenario C, the electricity supply changes a lot by enhancing coal-fired power during the whole planning period, while scenarios A and B are both showing decreasing trends. Another apparent difference lies on the facility 3 with NGCC conversion technology, which plays an important role on the electricity supply under scenarios A and B in period 3. In contrast, its contribution in scenario C shows considerable decline, and electricity supplied by facility 1 is correspondingly increased to meet the end users’ demands. Meanwhile, the results for capacity expansion of facility 1 and 3 under three scenarios are changing according to their proportions in the total electricity supply. For example, there is no need to expand the capacity of facility 1 for both scenario A and B during the planning horizon, but under scenario C, its capacity can not satisfy the necessary supply any more. Consequently, the expansion options of [1.2, 1.2] GW and [1.0, 1.0] GW should be taken in the period 2 and 3 for facility 1 at scenario C. There is no apparent discrepancy in electricity supply of facility 2, 4 and 5 for three scenarios, so is the capacity expansion. As for the imported electricity, it holds a noticeable position in the whole electricity supply in period 1 and 2 for all scenarios; however, it decreases to zero in period 3, which means the shortage of electricity can be handled through capacity expansion.The above analysis could generate alternative decision bases for planners regarding CO2 sequestration technologies. For example, scenario C with the least cost may be preferred in recessionary period; however, this cost-efficient strategy should be based on sufficient coal supply. If there are more oil and gas reserved in this region, scenarios A and B should be considered. Although these two scenarios generate the same schemes for both electricity supply and capacity expansion, scenario B is more efficient in the total system cost than scenario C. Therefore, scenario B would be preferred. Comparison between of the rate of imported electricity for two CO2 emission scenarios: (a) rate of imported electricity; (b) rate of renewable energy. Electricity supplies for three scenarios: (a) scenario A; (b) scenario B; (c) scenario C.
An interval mixed-integer non-linear programming (IMINLP) model was developed in this study to assist regional electric power systems planning under uncertainty. CO2 capture and storage technologies had been introduced to the IMINLP model to help reduce carbon emission. 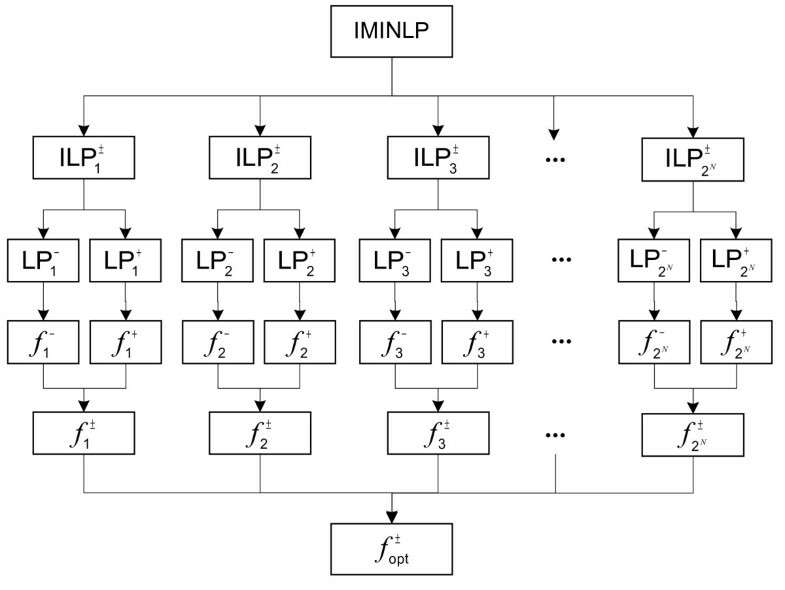 The developed IMINLP model could be disassembled into a number of ILP models, then two-step method (TSM) was used to obtain the optimal solutions. A case study was provided for demonstrating applicability of the developed method. The results indicated that the IMINLP was effective in providing alternative decision bases for electricity planning under uncertainty. This study is the first attempt for planning regional electric power systems with consideration of CO2 capture and storage technologies. The solution method for the IMINLP model is effective only if the total number of disassembled ILP models could be finite. As for the complicated regional electric power systems, if there are a large number of facilities to be planned with CO2 sequestration technologies, this method would be computation-consuming. In addition, we assume that the cost of power plant expansion would be independent to the capacity of expansion. That means the economies of scale issue is not considered in the IMINLP model. In fact, this issue may exist in some real world problems which will lead to a linear or more complicated relationship between the cost of power plant expansion and the capacity of expansion. In that case, the developed model is not applicable any more. Therefore, further studies are desired to tackle this issue and make the IMINLP model more applicable in the real world. The work presented here was carried out in collaboration between all authors. Dr. G. H. Huang and Dr. Q. G. Lin defined the research theme. Mr. X. Q. Wang developed the IMINLP model and the solution method based on Dr. G. H. Huang’s previous works, carried out the case study, analyzed the data, interpreted the results and wrote the paper. All authors have contributed to, seen and approved the manuscript.